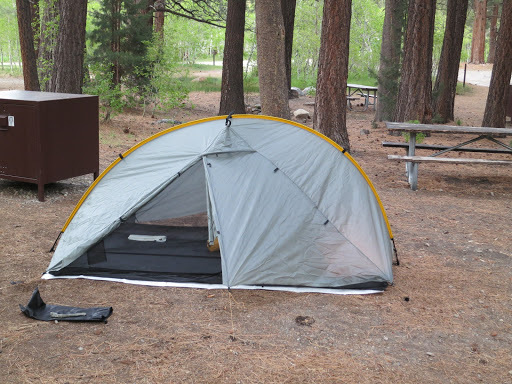 In late May we received the tent we hoped would be our home on the PCT next year. We had to make sure we liked this tent so we decided to go to Yosemite National Park and try her out. 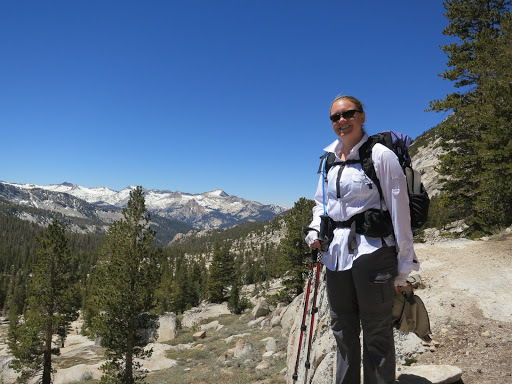 This trip would also give Laurie an opportunity to finally use her new backpack – the ULA Catalyst she purchased at the PCT kickoff. We drove to a campground east of Tioga Pass, set up our Tarptent Double Rainbow and sealed its seams.. We had enough day light, it was relatively warm with no wind, so why not? Twenty minutes later the job was done. 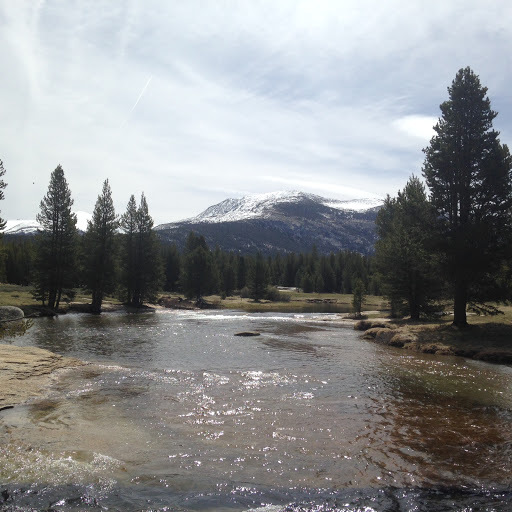 By 8am the following morning, we were in the car driving to the Tuolumne Meadows Ranger Station. 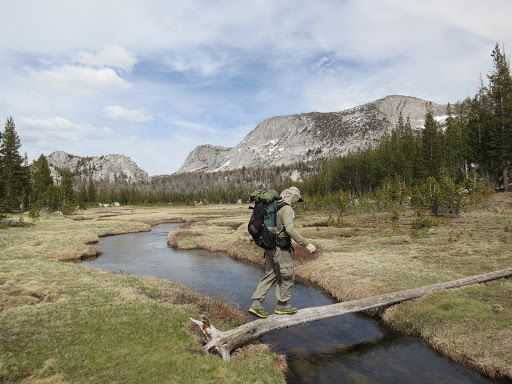 We geared up and hit the trail toward Vogelsang High Sierra Camp, an area of Yosemite neither of us had yet explored. 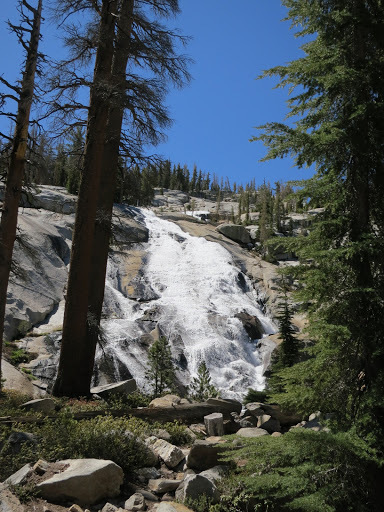 Our plan was to hike 15 miles to Merced Lake via the trail to the west that parallels Fletcher Creek and hike out the following day via Vogelsang Pass to the east. 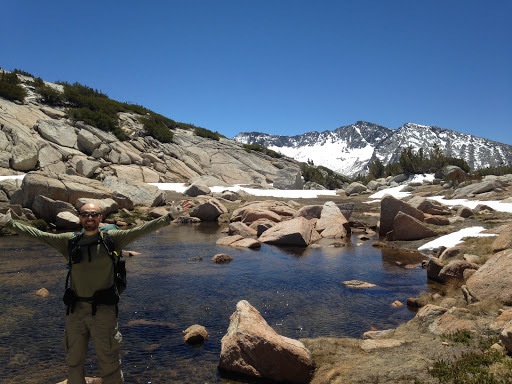 We shared fond memories of our individual JMT hikes in 2012 as we turned off the John Muir Trail in Lyell Canyon and onto the Rafferty Creek Trail. 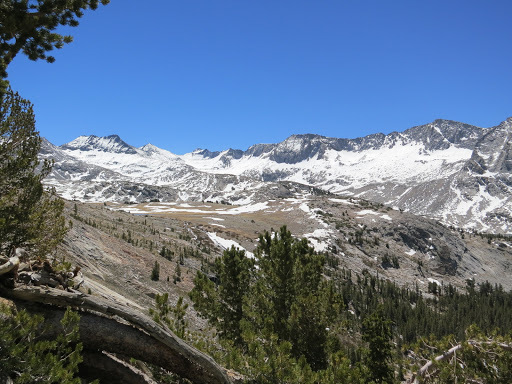 The wide open views got better and better as we hiked the 4.9 miles to the junction that would take us to the still closed Vogelsang High Sierra Camp. Our early start allowed us to take many breaks, soak our feet in the cool waters and enjoy the views. After the junction to Babcock Lake, we felt the burn in our legs and the heat from the late afternoon sun as we gained elevation. We contemplated ending our day at the crest of the climb partly because we were somewhat tired from two early morning starts we’ve had and partly because of the beautiful views, but we decided to keep going to make the following day easier instead of having to make up the miles from today. We are glad we kept going because the views got better and better. 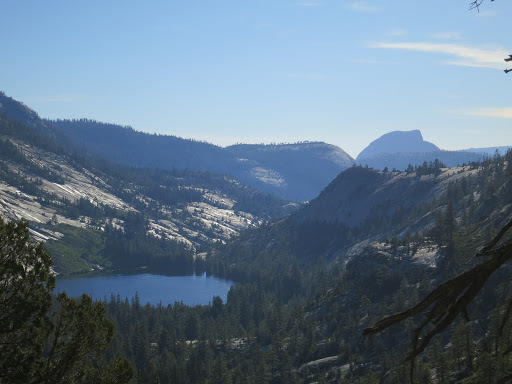 And soon, Half Dome and Merced Lake came into view. 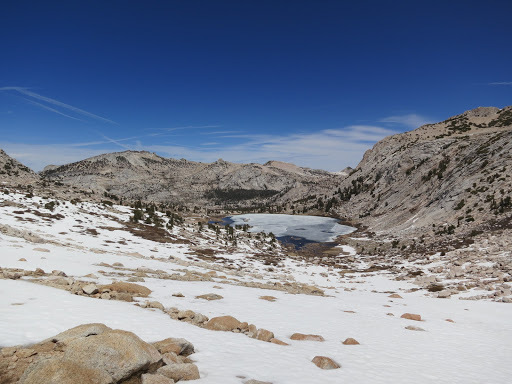 Spurred on by the views, we descended toward Merced Lake. At a clearing before the ranger station we decided to take a dip in the river, hoping our sweaty clothes would dry in the sunshine. After a refreshing soak, we put on our now dry clothes and proceeded down the trail. 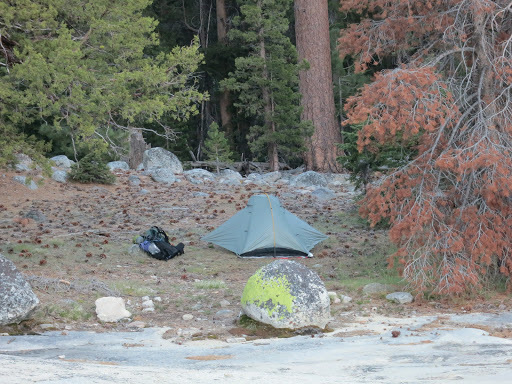 At Merced High Sierra Camp we chatted with two men – the only other people there besides us. Soon after, we left the Camp, hiked up to a clearing off trail and found a nice spot to set up our tent for the night. 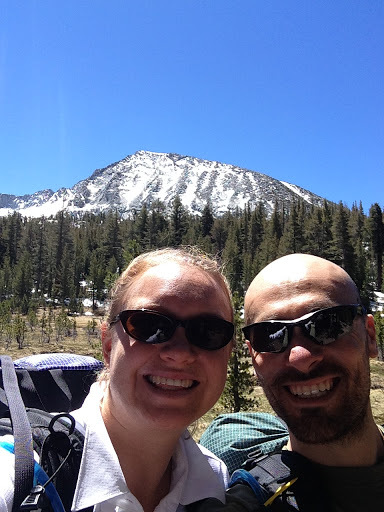 We sat on the warm granite rocks after setting up our tent, had dinner and watched the peaks change colors. Soonafter, we retired to our tents and were asleep before the stars came out. Laurie is a champion sleeper and was out like a light. As for me, I tend to sleep very well for the first few hours, but then I wake up and toss and turn for the rest of the night. Tonight though, I hardly slept. Because we didn’t want to smell the fumes of the seam sealant, we chose to forgo applying the sealant to our tent floor until after the trip. Our tent was on a slightly angled slope, and let me tell you, I found out really quickly how slippery the tent floor really is. Laurie slid into me for most of the night, pressing my pad and me into the netting all night long. The morning sun greeted us and promised yet another day of blue skies and warm temperatures. We packed up and were on the trail by 8am. Well, Laurie was anyway. She is quick to pack up get going but I take longer, which irritates her sometimes. A few minutes later, I was ready to leave as well. A few miles later we reached a scary log crossing. The log was roughly 12 feet above the raging river below and almost 20 feet long. Laurie went first. She didn’t know it but I was scouting other crossing locations (Laurie is more sure-footed than me and therefore more comfortable with water crossings). Before Laurie reached halfway, she stopped, looked back and said, “I can’t do it.” I went out on the log toward her, helped her turn around and get off of the log. This was the first time Laurie had been turned around by a log crossing. 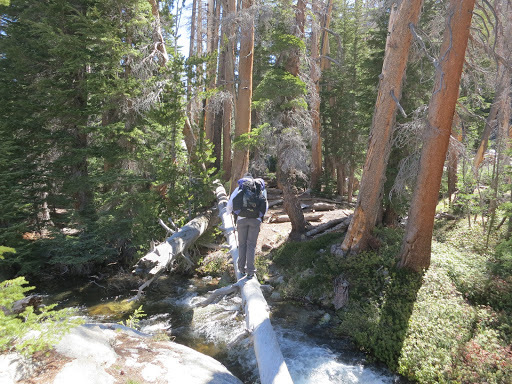 After reassuring her that this was indeed a harder-than-your-average log crossing, we found a safer area to cross and were back to gaining elevation in no time. The views soon opened up and once again we were stunned by the beauty of this area. So pretty! 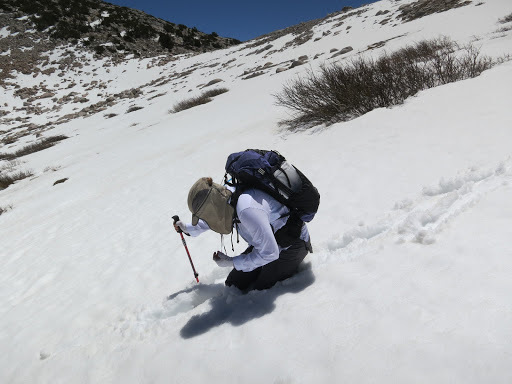 Every step we took, we gained in elevation and got closer and closer to Vogelsang Pass. And the views got better and better. 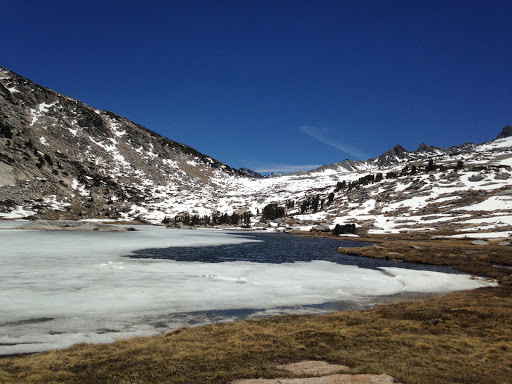 Many people referred to May of 2015 as Maybruary because the Sierras received lots of rain and snow. 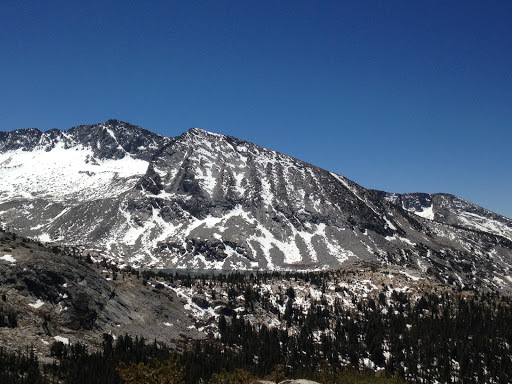 The snow was still present atop the distant peaks and made hiking hard work. All I wanted to do was stop and soak in the views. From Vogelsang Pass, we really got a sense of how much snow lingered from the recent storms. Looking down toward Vogelsang Lake, we knew it would be slow going. But we didn’t think it would be this slow. We postholed our way down the trail at a steady 1 mph, if that. At times we postholed down to our hip bones! And sinking only to our knees became something to rejoice. We were very relieved when we made it to Vogelsang Lake. Even the mozzies couldn’t stop us from taking off our wet shoes and sitting on a flat rock for a long lunch break. 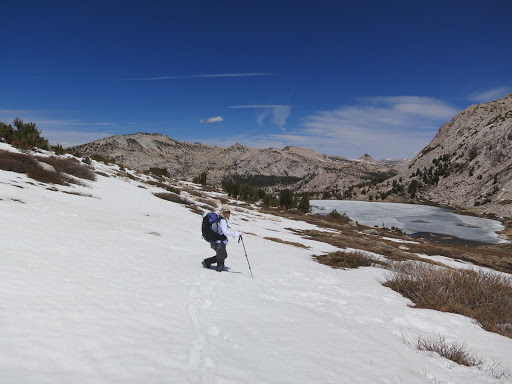 After lunch we hiked down to Vogelsang High Sierra Camp on mostly snow free trail. It was here where we began brainstorming about the following day. We had another day in Yosemite and wanted to make the most of our time there. 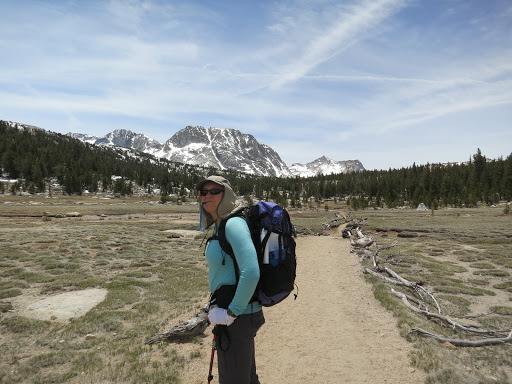 Laurie mentioned night hiking to Half Dome since we had a full moon. 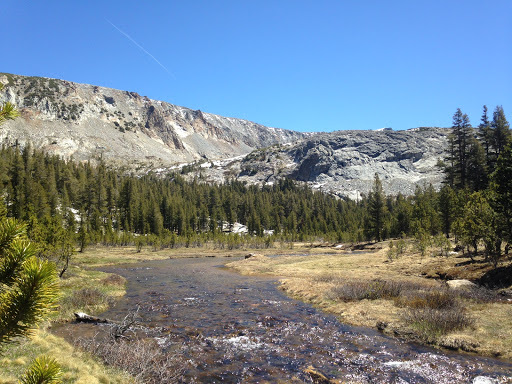 This was a hard decision for us to make because we had hoped to ride our bikes from Lee Vining to Tioga Pass and beyond. But we didn’t want to deal with all the car, truck and RV traffic. So the decision was made. We would hike Half Dome – at night! I ran down the trail in hopes of getting to the Ranger Station before they closed and securing our permits. But when I got there, they informed me that Half Dome day hike permits were only issued two days in advance. Then I asked, “What about overnight permits? Can we get an overnight permit for Half Dome one day in advance?” The ranger – much to my surprise – said yes. I greeted Laurie with permits in hand when she made her way to the Ranger Station parking lot. It was now 5pm. At 11pm we would start hiking again!